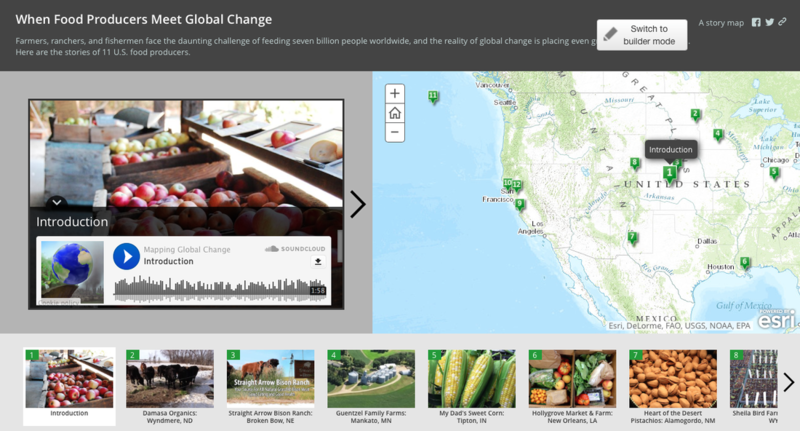 learn about impacts of global change on farmers, ranchers, and fishermen. Food producers — farmers, ranchers, and fishermen — are already feeling the effects of global change. Tasked with feeding over seven billion people around the world, food producers must grow ever more food for a growing human population while navigating new obstacles posed by a changing environment. Climate change has hit food producers hardest, in some cases bringing too little rain, in others too much. But food producers are also facing other aspects of human-induced global change, sometimes in subtle ways. Now, more than ever, with food at the intersection of climate change, pollution, population growth, and invasive species, we can all stand to learn from these global change pioneers. Follow their stories, using an interactive map of audio podcasts. We interviewed eleven food producers throughout the United States to hear their stories about global change. In the following StoryMap, follow us on a journey across the country to visit these eleven farms and fisheries. ﻿Listen to the ten audio stories below, or download them via SoundCloud. Read the eleventh story, A Minnesota Farmer Makes Use of Modern Agricultural Practices to Decrease Chances of Water Contamination. And we're not the only ones following food producers. In October 2015, the White House recognized the vital role of food producers in developing innovative solutions towards feeding a growing population in the face of a changing climate through its "Sustainable Climate-Smart Agriculture" program and Champions. Similarly, the United States Department of Agriculture (USDA) has begun reporting the unique challenges facing different farming regions of the US through its Regional Climate Hubs.